Cardboard boxes are most cats’ favourite toy, as they can play with them, climb on them, jump over them and hide in them. 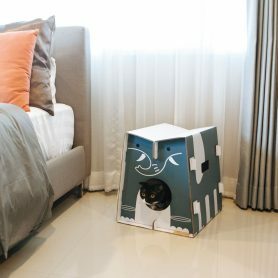 The box becomes a tiny fortress, giving your felines a sense of safety. This product design is inspired by the shape of a cat, from which lines are created and made into a house. 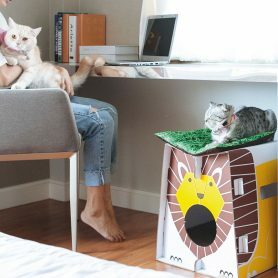 It is a mixture of a toy, cat scratching board and retreat. 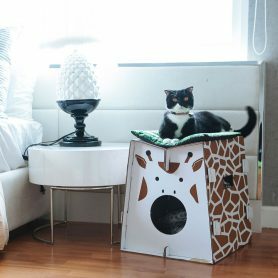 In line with the “safari” theme, animal motifs are added to the box, forming a furniture piece for cats and humans in order to facilitate the use for both the pet and its owner. The box can also be your cute ornament. 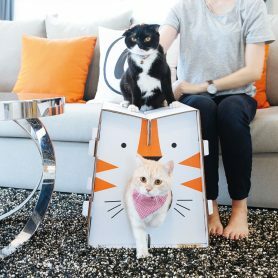 With the design for DIY, the pet owner also assembles the cat house for their pet.